I’ve always been a big fan of DIY puzzling. With seven nieces and nephews to keep engaged and entertained at family gatherings, I often find myself cobbling together new games and puzzles for them from whatever I can find around me. 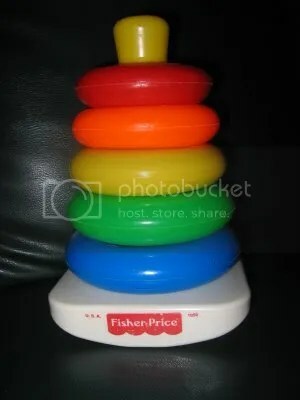 So last weekend, I discovered my youngest nieces have three of those ring-stacking toys with the colored rings, the ones I think every kid has played with at some point or another. And I realized I had all the tools necessary to whip up a challenge for the kids and adults alike… a Tower of Hanoi puzzle. 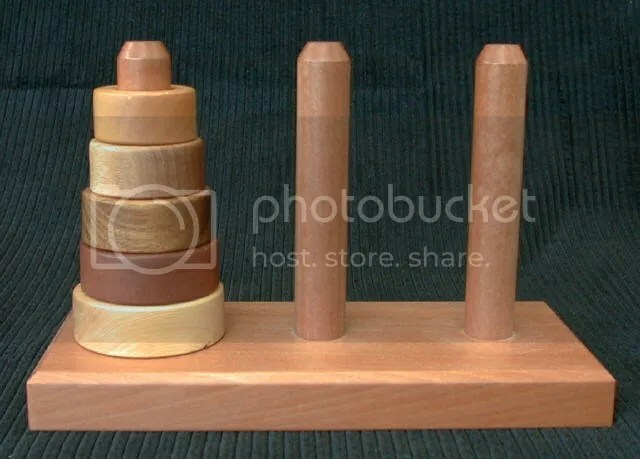 The Tower of Hanoi puzzle and its many variants look simple, but can be fiendishly puzzling. The rules are simple: move the stack of rings from the first post to the third. You move one ring at a time, and at no point can you place a larger ring atop a smaller ring. The kids, on the other hand, worked together, and managed to solve the puzzle in about fifteen minutes, each taking turns moving colored rings here and there (and for my youngest niece, occasionally biting them, as you do). Their sense of accomplishment was a joy to watch, and each crowed to their parents about their victory. As a placement puzzle, the Tower of Hanoi is much like a sudoku puzzle, a combination of strategy — where to place a number or a ring — and deduction — determining which moves you can’t make based on the information provided. It’s one of those universal puzzle-solving skills that will serve a puzzle fiend well for decades to come. This entry was posted in Games, Puzzles and tagged DIY puzzling, games, Geeking Out, Puzzle to solve, PuzzleNation, Puzzlin' fool by gmdirect. Bookmark the permalink.